super frustrated that my scores aren't trending the way i want them to--any help/tips would be appreciated! Originally posted by alittlemorerock on 19 Mar 2019, 18:17. Last edited by alittlemorerock on 19 Mar 2019, 18:32, edited 1 time in total. Have you analyzed these tests to identify the areas that you need to work on? It's probably not going to be particularly easy, as 710 is itself a very good score (which means that you don't have many weaknesses). If I had to guess, I'd say that quant is the one you should focus on right now. Also, you might want to edit the 710 (Q49 V49) score, as 49 on both quant and verbal would lead to a higher total score. Are you taking the actual exam soon? In that case, you should probably focus on consolidation rather than on major score improvements. Make sure that your timing strategy is in place and that you execute it on the day of your exam. You might need to reduce the number of hours you're putting in as well: you want to conserve your energy for the actual exam. Otherwise, it's not just about getting a question wrong. As someone who is consistently getting very good scores, you shouldn't expect any low-hanging fruit here. That is, it'd be great if there is some small problem in your approach that can be fixed quickly, but don't depend on it. Go through the questions you've done and check whether there are some things in the quant section that take more time on average, that you are generally uncomfortable with, or that lead to careless mistakes in an exam situation. You may need more practice questions and tests (if you have the time to do them). Assuming that you took these CATs in a realistic fashion that matches what you'll face on Test Day, then you appear to be a really strong critical thinker - which is good. 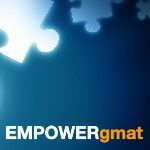 At higher-and-higher score levels, the GMAT becomes really 'sensitive' to little mistakes (especially on 'gettable' questions), so to score higher, you really have to nitpick WHY you're getting questions wrong. In simple terms, how many questions have you been getting wrong on each CAT that you COULD have reasonably gotten correct if you had just done a little more work (or organized your work in a slightly different fashion)? If your Test really is in about a week, then you shouldn't try to make any major changes to how you handle the Exam - and you should not try to 'cram' either. Some general review and light practice would be fine, but you would be better served by getting some extra rest so that you can go into Test Day calm, clear-headed and ready to work. 4) When is your exact Test Date? I’m glad you reached out, and I’m happy to help. So, 710 is a great start! That said, in order to improve your GMAT score, you need to go through go through GMAT quant and verbal carefully to find your exact weaknesses, fill gaps in your knowledge, and strengthen your skills. The overall process will be to learn all about how to answer question types with which you currently aren't very comfortable and do dozens of practice questions category by category, basically driving up your score point by point. When you do dozens of questions of the same type one after the other, you learn just what it takes to get questions of that type correct consistently. If you aren't getting close to 90 percent of questions of a certain type correct, go back and seek to better understand how that type of question works, and then do more questions of that type until you get to around at least 90 percent accuracy in your training. If you get 100 percent of some sets correct, even better. I think you are already doing great in Mocks. To improve your score further, you should focus a bit more on Verbal. Taking multiple mocks might help. Apart from the GMATPREP, Manhattan GMAT tests and Veritas Prep Tests in my experience have good verbal and Quant section and will certainly help you point out and improve your weak areas. I would also encourage you to purchase the GMATPREP QP 1 for some great additional practice.